X-Men: Days of Future Past takes place in an alternative present where mutants are an endangered species - unstoppable war machines are determined to bring extinction to Charles Xavier and his clan. The film runs simultaneously in the past too; Wolverine, in a Terminator-esque role, returns to Nixon-era America to unite Xavier and Magneto with the intention of rewriting the future and averting the catastrophic developments of the present. At stake in the movie, partially set in the aftermath of the Vietnam war, is the soul of America. Here she is represented, rather appropriately, by America's Sweetheart Jennifer Lawrence. Mystique (Lawrence) is the key to the fate of all mutants - it is her actions which ultimately lead to the policy developments which will wipe out her kind. Battling over her mind, and heart, are the 1970s Charles Xavier (James McAvoy) and Magneto (Michael Fassbender) - does Mystique/Raven side with Xavier, the liberal "nice guy" with entitlement issues who proposes non-violent opposition to their foes, or does Magneto's zero-tolerance "might-makes-right" belief system inspire her passions? Maybe, as is ever the case in life, there's a bipartisan third way? As an ideological battle takes place between the dueling frenemies, Dr Trask (Peter Dinklage) continues to develop the Sentinels which will systematically destroy all mutants unless he is stopped. But can our heroes, stationed worlds apart morally, agree on the best way to halt the scientist? Bryan Singer returns to the franchise in an attempt to recover a lost mojo (a professional career nadir was reached recently with Jack and the Giant Slayer - 2013's worst film by a country mile). Here, he injects wit, spark and energy (factors often absent in his filmography); Days of Future Past zips along at a pleasing speed, never letting up on action or humour even if this does mean neglecting character development for long stretches. Oscar winner Halle Berry, for example, does little but pull angry faces in scenes of combat whilst Oscar nominee Ellen Page spends the majority of the film stood still with her hands held adjacent to Wolverine's head. Ultimately, Days of Future Past is a feature which is unlikely to win any new converts to the cause - if Singer's original X-Men films were too cartoon-ish or throwaway for personal tastes, there is little here to persuade a viewer to give the franchise a second chance. For those not overly familiar with the series, the plot may prove overly convoluted too. However, for the majority of film-goers who have been stunned by Marvel's cinematic forays, Singer's movie provides a lot to enjoy. 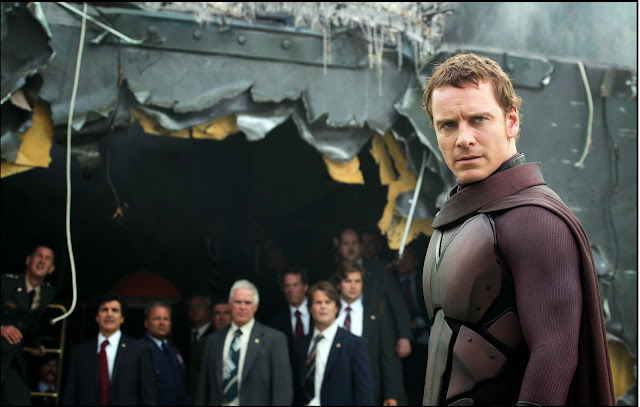 A humanist message, technical bravura and an outstanding turn by Fassbender as a principled, yet arguably flawed, Magneto hold Days of Future Past together. Whilst the movie might not manage to measure up to the standards of the top-end productions in this genre (such as Avengers Assemble - undoubtedly the benchmark for all superhero films), Singer's latest feature mixes subtle smarts with brainless action in a winning manner. Overall, a decent, albeit daft, popcorn movie. * With thanks to Showcase Cinemas for inviting me to an XPlus preview of this film.